Today, hop on Tokyo’s subway system for a PRIVATE GUIDED SIGHTSEEING TOUR of the city. First, stop at MEIJI SHRINE, a magnificent 20th-century Shinto monument set in a man-made forest. Next, stop at the SAMURAI MUSEUM to learn about their history and see authentic period-specific swords, armor, and helmets (kabuto). You will even have the chance to have your picture taken wearing a helmet and armor! You’ll also stop at SHINJUKU GYOEN GARDEN which dates back to the early 1600s. Lastly, visit bustling NAKAMISE SHOPPING ARCADE and ASAKUSA KANNON TEMPLE, the oldest of their kind in Tokyo. The remainder of the day is at your leisure. Today, enjoy a full day at your leisure. Your Local Host will have suggestions. Today, transfer to the train station and board your BULLET TRAIN to historic Kyoto, former capital of Japan. Upon arrival, transfer to your hotel. The rest of the day is at your leisure. 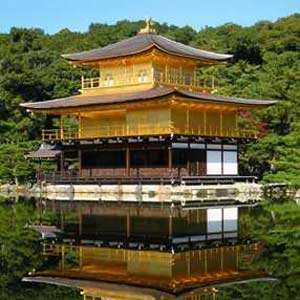 This morning, your PRIVATE GUIDED SIGHTSEEING starts at stunning Kinkakuji, TEMPLE OF THE GOLD PAVILION, covered with shimmering gold leaf. Next, take a WALKING TOUR through Gion, Kyoto’s most famous geisha district, which is also known for its high concentration of machiya-style merchant houses. Continue on to SANJUSANGENDO TEMPLE, famous for 1,001 statues of Kannon, the Buddhist goddess of mercy. Flanking the main statue are 1,000 life-sized statues, covered in gold leaf, with 40 arms said to have the power to save 25 worlds. Finish with a visit to FUSHIMI INARI SHRINE, renowned for the thousands of brightly colored Torii Gates. A full day at leisure to explore more of Kyoto’s historic temples and shrines. Your vacation ends with breakfast this morning. 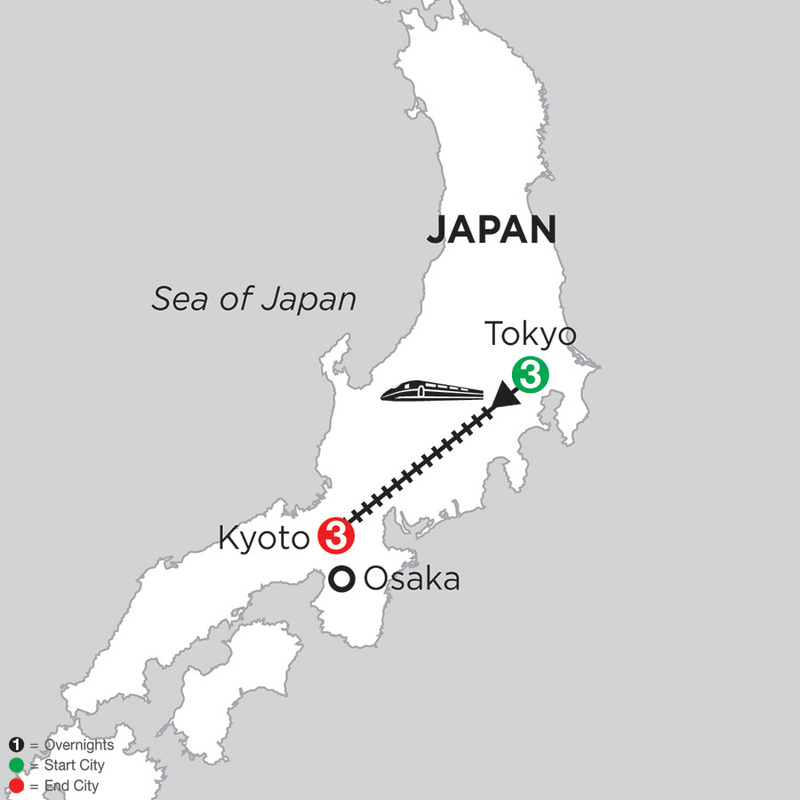 Homebound flights from Kansai International Airport in Osaka should not depart prior to 11 am. Located in the quiet neighborhood of Shibadaimon area and within walking distance of a metro station. Guestrooms offer an elegant environment featuring a taste of Japanese culture. Located in the heart of Kyoto's downtown, the Karasuma Kyoto Hotel welcomes you with friendly service. Their restaurants serve a variety of cuisine. Bar Anchor features seasonal cocktails and single malt Scotches. Amenities include currency exchange, a grocery/convenience store, a gift shop/newsstand and laundry facilities. A safe deposit box is provided at the front desk. This central Kyoto hotel is a two minute walk from a subway station and a bus stop. Attractions within 1 mile include Kyoto International Manga Museum, Higashi Honganji Temple, Gion Corner, Nijo Castle, and Kyoto Tower. Clean and simple rooms include high-speed Internet access, flat panel cable TV, and air-conditioning. The Hilton Tokyo is the the perfect base for exploring the vibrant, energetic city of Tokyo. The hotel offers complimentary Wi-Fi throughout the Lobby and Marble Lounge. Rejuvenate in the 24-hour health club within the hotel and relax in the sauna or soothing whirlpool spa. Choose from seven tempting restaurants offering a range of delicious cuisine. Favorites include Dynasty authentic Chinese restaurant, and Musashino, featuring sushi, tempura and teppanyaki. For a relaxing evening drink, visit St. George's Bar. This hotel is in Tokyo's bustling Shinjuku neighborhood a short distance from the Tokyo Metropolitan Government Building and within one mile of Studio Alta. Feel at home in a Hilton Guest Room, located on the higher floors, with traditional Japanese touches. The luxurious Park Hotel Tokyo is the perfect base for exploring the energetic city of Tokyo. Located on the 25th floor, the hotel offers stunning views of the city. One of the largest atriums in Tokyo, spreading through ten floors, rises above the main lobby, decorated with modern artwork and several eateries featuring various International cuisines. Ideally situated in Shiodome, a flourishing center of business and culture. It is possible to reach the hotel from all the stations in the area via an extensive pedestrian bridge or the underground passage network. Rooms offer sweeping views of the surrounding city from its large picture window and bathroom amenities from the luxurious THANN Aromatic Wood Collection. "Well-furnished rooms with a work-desk, Television, telephone, high-speed internet access, air conditioning, hairdryer, refrigerator, bath, shower and toilet. " Located in the heart of Kyoto, Hotel Okura features spectacular views of the city and the Higashiyama Mountains in the distance. Comfortable and contemporary public spaces and guestrooms feature modern amenities and stylish décor. Situated in the heart of Kyoto with easy access to the city's best attractions, including Nijo Castle and the Gion District. Spacious rooms feature a sophisticated and elegant design, with large windows that overlook the city of Kyoto. Amenities include plush linens, premium bedding, sitting area with sofa, and complimentary Wi-Fi. The ANA Crowne Plaza Kyoto looks almost out of place with its modern exterior nestled amongst the sublime beauty and historic grandeur of Japan's old capital. This however belies the traditional hospitality and classic atmosphere you will experience during your stay. Just 100 yards from Nijo Castle, in Kyoto's historical district, this modern hotel is 1 mile from Kyoto Imperial Palace and Sento Imperial Palace. The city center, Kyoto Shi, is located 1.2 miles from the hotel. Each room has been designed to be spatially superior and cozy, a perfect place to relax and unwind from a day of travel or work. Fitted with a host of facilities to satisfy any needs, a stay at this hotel will surely be an experience to remember. The imperial capital of Japan for more than a thousand years, Kyoto is celebrated today as the "City of Ten-Thousand Shrines." In the company of an expert Local Guide, head out to explore and photograph some of the city's most iconic landmarks. 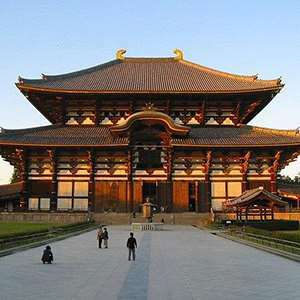 We'll introduce you to some of Japan's oldest Buddhist temples and most ancient treasures when you travel to Nara, the first permanent capital of Japan during the 8th century, on this wonderful afternoon excursion. Monograms provides travelers access to a Local Host®, so you will have someone on hand to answer those vacation questions pertaining to Tokyo. No waiting in line at the concierge desk or trying to ask your waitress at breakfast directions to the shopping district. Simply ask your Local Host® about Tokyo and you'll be on your way in no time. Plus, your Local Host® will share local Tokyo insights and share suggestions for getting off the beaten path, leaving you more time to create lasting vacation memories that are yours alone. Hi everyone! I'm Rumi and am proud to work as a tour guide in Tokyo, the coolest city in the world. I'm excited to help you discover all there is to this incredible city. I am quite confident that you will enjoy traveling in Tokyo. Founded in 628, Sensoji Temple is Tokyo’s oldest temple. According to legend, two brothers found a statue of Kannon, the goddess of mercy, while fishing. They returned the statue to the river, but it in turn kept returning to them, so they built the temple for the worship of Kannon. Consult the oracle inside the temple to have any question answered! The Edo-Museum celebrates the history and culture of Edo-Tokyo and creates a vision of the city and life in the future. The permanent exhibition, showcasing original objects and replicas, offers visitors a journey through the 400-year history of Edo-Tokyo since Tokugawa Ieyasu entered Edo. This massive market may have meats and flowers, but the main attraction is the estimated 2,000 tons of seafood handled each day. Arrive early (around 3 am) to see restaurant purveyors and chefs engage in the tuna auction, which ends at 6:15 am. Make sure you try some of the freshest sushi you’ll ever find at one of the on-site restaurants. Shopping the Ginza is a unique experience—massive department stores, futuristic products, and gracious service are all trademarks. It’s worth a half-day’s stroll around this eye-opening area, even if you don’t plan to buy —particularly on weekends, when a large section is closed to cars. One of the 23 wards that make up Tokyo, Shinjuku thrives around Shinjuku Station, the busiest train station in the world. This large entertainment, shopping, and business area is a great place to walk around and soak in the atmosphere, do some shopping, or get a birds-eye view of Tokyo at the Tokyo Metropolitan Government Center. Here you can ascend to the 45th floor of either the North or South observatory for sweeping views of the city, for free! Akihabara or “Akiba” is known for the hundreds of electronic stores around Akihabara Station and lining Chuo Dori. From large shops on the main drag to small shops on the side streets selling anything from the newest camera’s to secondhand electronic junk, this is a fascinating area to visit, especially for techies! Although many shops offer goods that will only work in Japan, you can find English-speaking shops that offer goods for use overseas. If you do plan to buy, bring your passport and shop duty free for larger purchases. The traditional Japanese theater form called kabuki began in 1603 and continues to this day. While you may not speak the language, the themes—such as love and revenge—are usually universal enough to understand. You’ll want to see the elaborate costumes and the skill of the performers, who often sing and dance. Shinbashi Enbojyo is the perfect theater to witness this fascinating art form. With an expansive beer garden that feels more like a backyard, this bar is the perfect place to relax after a long day. Sekirei is popular with the happy hour crowd, and you may want to join them to escape the throngs of the city. Enjoy a drink beneath a pine tree as dancers in kimonos perform on the lawn. Prices are very reasonable, especially considering the upscale atmosphere. Monograms provides travelers access to a Local Host®, so you will have someone on hand to answer those vacation questions pertaining to Kyoto. No waiting in line at the concierge desk or trying to ask your waitress at breakfast directions to the shopping district. Simply ask your Local Host® about Kyoto and you'll be on your way in no time. Plus, your Local Host® will share local Kyoto insights and share suggestions for getting off the beaten path, leaving you more time to create lasting vacation memories that are yours alone. My name is Kyoko, and I am a Local Host in Kyoto. I have almost 30 years of experience showing visitors all this wonderful city has to offer. As your Local Host I would like to show you the most charming points of the city and some of Japan’s greatest treasures. This is Kyoto’s most famous geisha district and is highlighted by traditional machiya-style merchant houses, which are narrow and long. The area is infused with ochaya (teahouses where geisha entertain), shops, and restaurants—making it the perfect place for shoppers and foodies to explore. One of the highlights is a stroll along the Shirakawa Canal by night. The canal is lined with willow trees, and when illuminated, it is a beautiful sight. Keep in mind that the chances of seeing a geisha walking around increases at night, but it is still a rare occurrence. Your best bet is to take in a show or visit an ochaya for tea. Located in the eastern part of Kyoto, Higashiyama is one of Kyoto’s eleven wards featuring charming restaurants and shops. It is a great place to buy local pottery, candy, or regular souvenir items. The highlight of the area is Kiyomizudera “Pure Water” Temple, a UNESCO World Heritage site built in 780 AD, by one of the oldest Buddhist sects in Japan. Taste the spring water that gives the temple its name and enjoy sweeping views of Kyoto from the famous wooden terrace. Kyoto is famous for its Japanese Rock “Zen” Gardens. The most famous is the karesansui (dry landscape) rock garden at Ryoanji Temple. Here the simple use of moss-covered boulders representing waterfalls and raked gravel representing waves make for a calm space to lose your mind in thought. Lesser known but equally impressive is the garden at Saihoji Temple, also known as Kokedera (Moss Temple). This UNESCO World Heritage site is a fine display of the other Japanese garden-style called tsukiyama “hill garden,” which typically consists of a hill with a stream and pond. Here you can meander through the paths and admire the beauty surrounding you. This covered street market is where the local residents, restaurants, and hotels buy their food. Here you will find traditional Japanese cooking ingredients such as pickled daikon, mushrooms, and octopus as well as savory foods to eat like baby squid, fish cakes, and sushi. You will also find other items for sale, including dishes, cooking utensils, and clothing. It is best to go in the morning before things pick up and the locals do their shopping. Hours of operation vary, but shops are typically open from 9 am to 6 pm and closed on either Wednesday or Sunday. Located to the northeast of Kyoto, Mount Hieizan is home to Enryakuji Temple, one of the most important religious sites in Japan. Originally built by Buddhist monks of the Tendai sect in 788 to protect Kyoto from evil spirits, it eventually grew into a monastery complex with both size and power. In fact, it had so much power that in 1571, the mountain was invaded, and every building was burned to the ground. The complex was rebuilt in the 17th century when new rulers came to power. Ride a cable car up the mountain and explore the temple and other buildings in a beautiful mountain setting. This “Temple of the Silver Pavilion” was built by the grandson of the man who built the “Temple of the Gold Pavilion” with the intention of covering it in silver leaf. Don’t expect to see the glimmer though as unfortunately his plans were never carried out. Nonetheless the temple stands as a monument of simplistic Japanese design and has lovely gardens so it is definitely worth a stop. The “Pure Water Temple” is the most popular Buddhist temple in the city. For over 1200 years, pilgrims have climbed the slope to pray to the temple’s 11-headed Kannon image and drink from the sacred spring. The main hall which is a Japanese architectural marvel is made with no nails and offers wonderful views of Kyoto.